CAP Your Landlord! 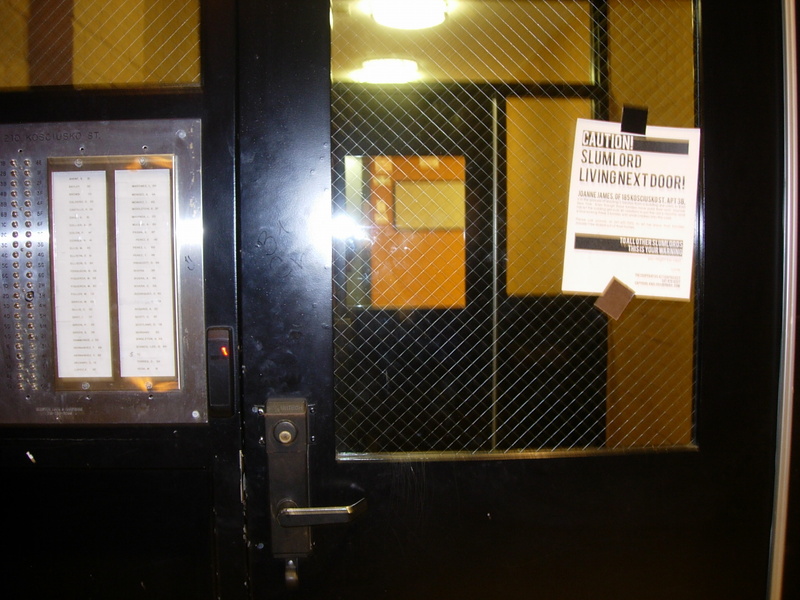 | landlord or boss giving you hell in nyc? CAP 'em! landlord or boss giving you hell in nyc? CAP 'em! 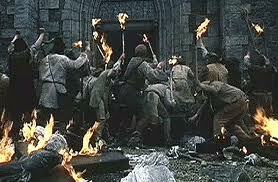 Last night, a crew of CAPers headed out into the night to help fight back against a slumlord. Joanne James, of 185 Kosciusko St, Apt 3B in Bed-Stuy, has been busy evicting 3 families from a building she owns in East New York. These 3 families, all of whom have small children, have paid their rent. Joanne hasn’t even bothered to give a reason why she’s evicting them. I guess she wants to play hardball? That’s fine, CAP loves hardball. 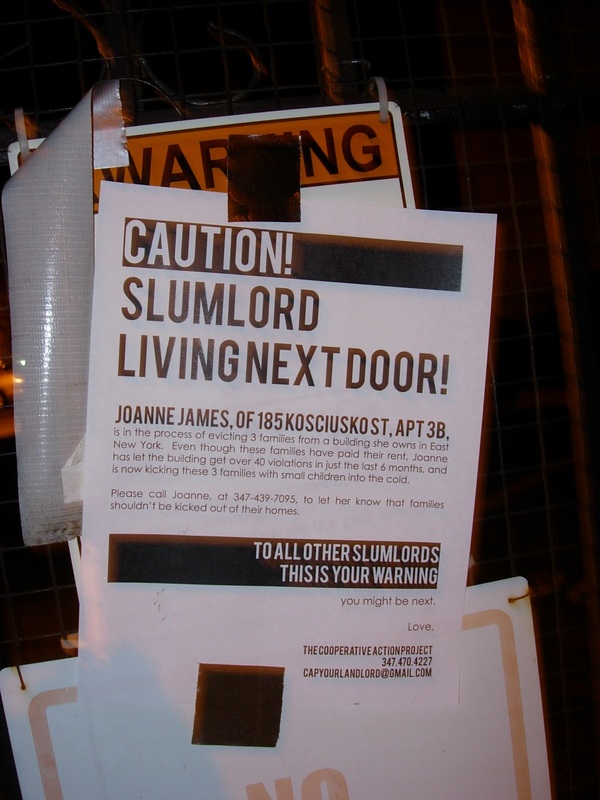 These posters were put up all over her door, her building, her block and anywhere else we figured she might walk by. Feel free to call her at 347.439.7095 to let her know how you feel about evictions. Time to wake up Joanne – Chickens are starting to come home to roost. CAP’s First Action A Big Success! 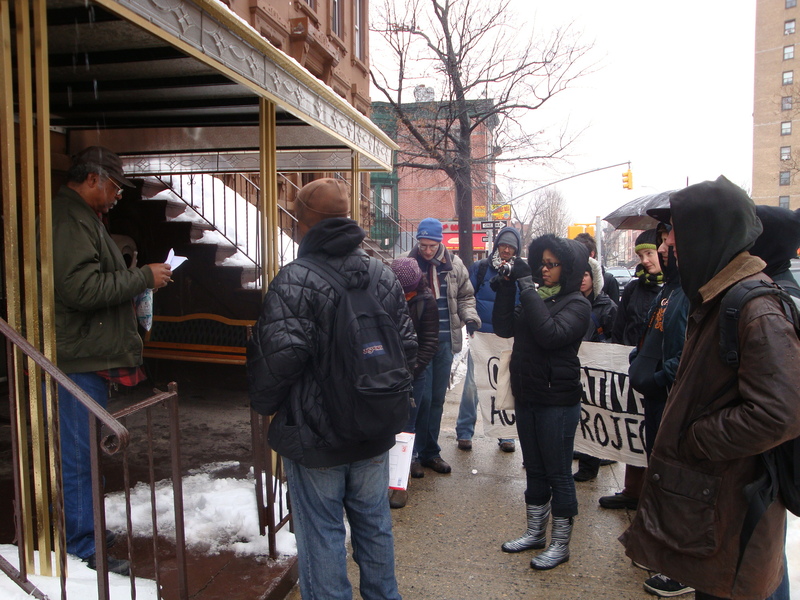 On a cold, rainy afternoon this past Saturday, a group of 14 CAPers braved the weather to stand in solidarity with a tenant declaring rent strike. 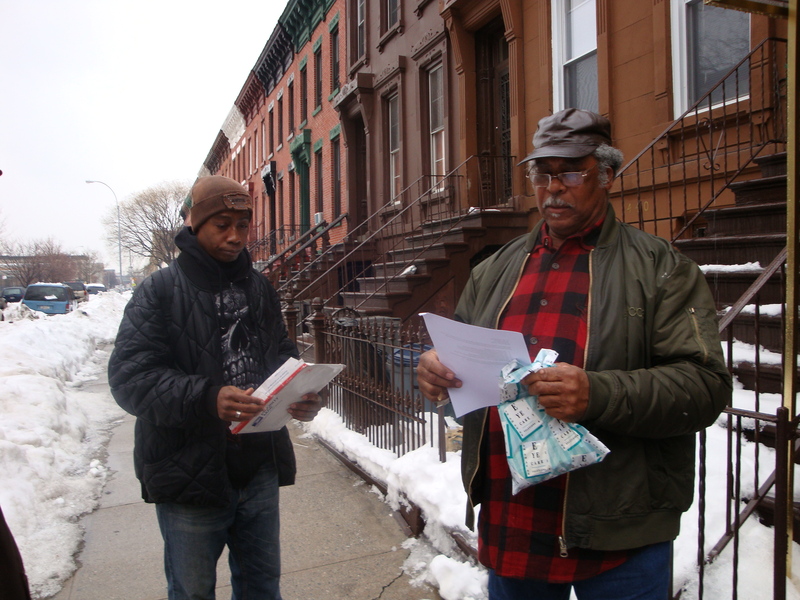 After months of trying to get his landlord to make repairs to his Bed-Stuy apartment, including fixing potentially life-threatening electrical problems, tenant Mark came across a CAP flyer, and decided to give us a call. Mark had already decided to go on rent strike, and was asking for support. Then, out of nowhere, the slumlord was surrounded!! That’s right landlord, YOU JUST GOT CAP’D!! So the Department of Buildings put together a list of the 200 ‘worst buildings’ in New York. This may come as a shock to you, but over a third are in Brooklyn, while only 1 is in Staten Island. Another reason to hate Shao-lin? Tomorrow! Time to CAP a Landlord! What: We’re getting a big crew together to stop by a slumlord’s house to give him a letter announcing a rent strike by one of his tenants. The conditions the tenant has been forced to live in are inhumane, and it’s time we help him fight back! Feel free to bring signs or banners! Sunday, Sunday, Sunday-Putting Up Posters! 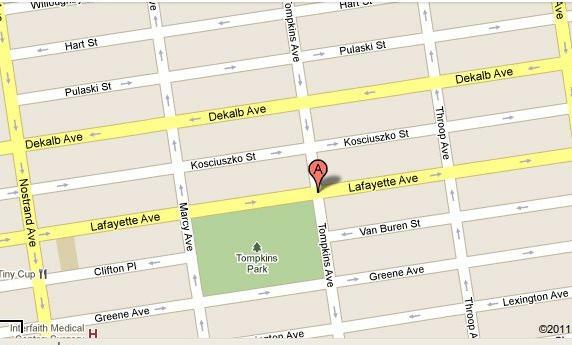 3pm, Corner of Lafayette and Tompkins. If you can’t make it out on Sunday, you can help by printing out the posters on the website and putting them up yourself. Or better yet, organize on your own, and let CAP know when you’re having demonstrations or protests and we’ll bring people out. Help us strike fear into the hearts of landlords and bosses! 1. We’re not a charity or a non-profit organization. 2. We are a network of people who have certain things in common—we pay rent, we work for a boss—and believe that fighting back together is the only way we can improve our lives. 3. If people want help from this network, they have to help with other people’s struggles in return. This is based on the idea of ‘mutual aid’, which says that if people cooperate with each other, they can get much better results than if they try to accomplish something on their own. First, a person having a problem with their landlord or boss gets in contact with us. This could include their landlord trying to evict them or refusing to make repairs, or it could be their boss trying to unjustly fire them or not pay them what they’re owed. After they call or email us, we schedule a sit down with the person to hear the whole story of their problem, and explain to them that to get help, they have to agree to help out with at least 3 other events that aren’t for their campaign. Then, together we come up with a plan of action to fight back against the boss or landlord. The idea is that our network of people will come out in numbers to rallys and demonstrations that will put pressure on your boss or landlord, and force them to give you what you want. This could include picketing your job, going to a landlord’s office or house, or flyering around a boss’s neighborhood letting people know what a scumbag he is. More often than not, they won’t want all of that attention, and will end up giving up. After the campaign is done, the person that we helped out will then have an obligation to help out on at least 3 other events, and will hopefully be interested enough in the project to want to come out to even more!